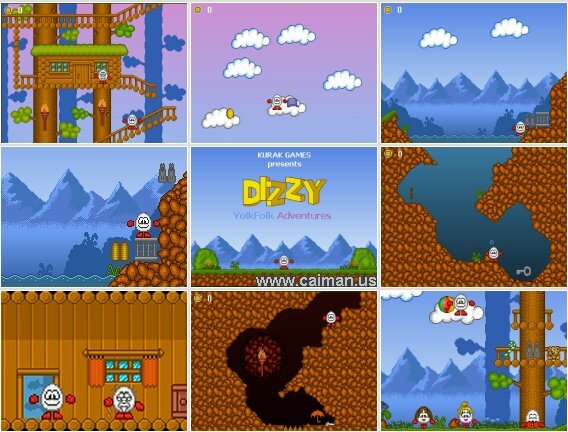 Caiman free games: Dizzy YolkFolk Adventures by Kurak Games. At the edge of calm village Yolkfolk, three friends - Daisy, Dora and Poggie were playing with a ball. Suddenly, Poggie tossed the ball too high and it landed up in a cloud; then Poggie ran away on a tree. Daisy and Dora called Dizzy for help. He is the only one to deal with the problem! 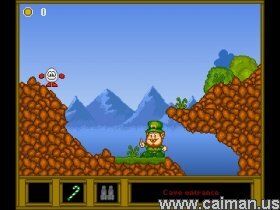 You only have one single life, and there is no save/load function but Dizzy YolkFolk Adventures is a very short game so it really doesn't need a save/load function. The graphics and gameplay are great. The only strange thing is that you do can use the cage to climb the cliff, but not a tree.